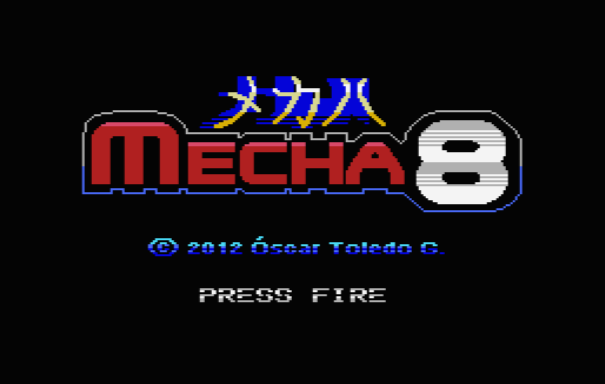 Mecha 8 plays fast, which is normally a good thing, but a few mechanical flaws let the game down. Taking a single hit from enemy weapons fire instantly removes all weapons and speed upgrades snatched from slain enemies, and in a fast moving game like this (with an inarguably oversized player sprite) getting hit happens a lot. The sad result of this is a game where weapons powerups are dished out to the player and then yanked away again within seconds. The same goes for speed upgrades, which are quickly lost with the first bullet the player's mecha takes. But now and then I found myself getting on a roll, in that sweet spot, the perfect storm where a speed bonus and a weapons powerup came along together at exactly the right time, and I found myself having more fun than I expected. When Mecha 8 hits its stride it's a fun game, but this is inevitably brief, and within seconds it's back to piloting a lumbering bullet magnet with a peashooter. The presentation in Mecha 8 is a mixed bag. The player's mecha is portrayed as a wireframe 3D model, which would look really cool on a sparse, minimal background, but just looks odd flying over a more realistic, full-fat city. 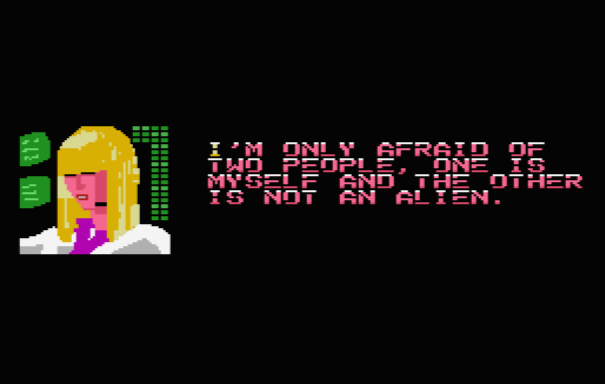 There have been a few poor choices in the palette stakes as well, with some enemies tending to disappear as their colours become lost in the background. 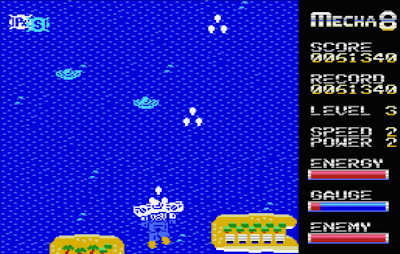 In the game's defence, however, anyone beating through the first level will find that the simpler backgrounds of later stages work much better and there's little to no inconvenient disappearance of enemies. To add even more variety the end bosses appear to have had more time lavished on them than anything else in the game; the first one being especially well realised, with more than a hint of Battletech about it. 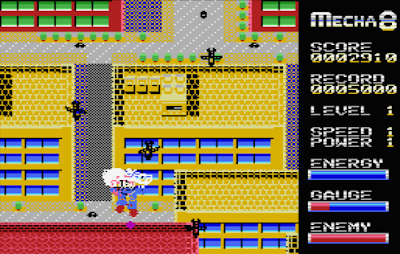 The player's robot switching from flying mode to walking mode was quite a nice touch, although didn't appear to change the gameplay that much. At least it shows some creativity, and from the game's unravelling of the storyline as play progresses you cannot deny that the designer has clearly invested in his work - it does look like a lot of love has been put into it. I've rarely had this many mixed feelings about a game; It would be a lie to say I haven't had moments of genuine excitement playing Mecha 8, but they've been far outnumbered by moments of frustration and I found my motivation to replay running out much quicker than usual. I can see what the developer was aiming for with this game, and there are a few good ideas in there. Coding a game for a contest obviously adds time restraints, and not everyone does their best work under pressure. Perhaps if there had been more time to work with Mecha 8 would have been a much better game; but as it stands this flying robot (for me anyway) doesn't really make it off the launch pad. Recently I've found your review. 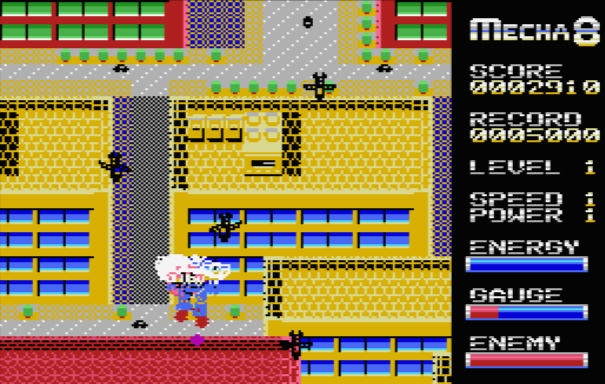 Since then I've improved greatly the game and now is available in cartridge for MSX and soon for Colecovision.